Today, the issue of digital equity is receiving more attention than ever. For good reason; Internet access is no longer a luxury, it is a daily necessity in how we live, work and play. 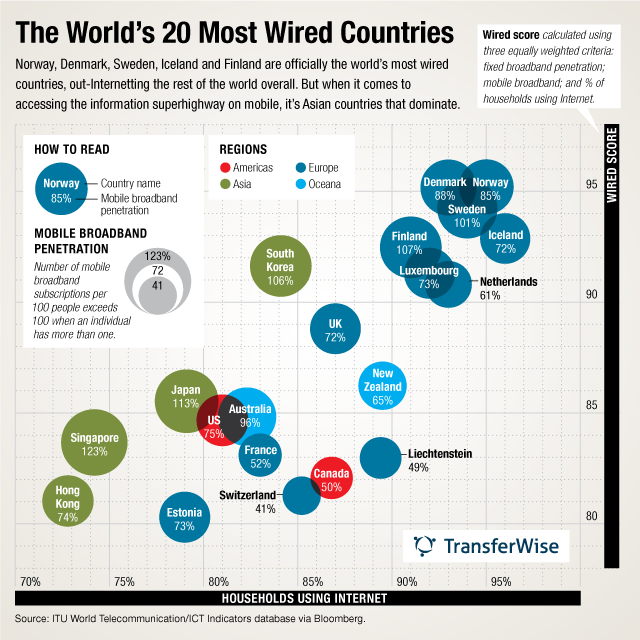 Still, we are far from the most connected nation on earth (as shown above from TransferWise), and a quarter of our homes aren’t yet on broadband networks. One issue is that the digital divide isn’t a simple binary split between “haves” and “have nots.” There are many shades of grey in between. Not everyone uses the Internet and connected technologies the same way, with the same skill set, or even with the same context. Before we can solve this divide, we have to understand these subtleties. I met Michael Liimattta at an event last week and he got me started thinking about this in more detail. He is the co-founder of Connecting for Good, a Kansas City nonprofit focusing on digital inclusion. I have taken his remarks from this blog post and added my own thoughts as well. In our efforts to level the digital playing field for low income families, we must avoid the assumption that all of them relate to technology, computers and the Internet in the same way. To be effective in digital inclusion efforts, we must recognize that there are at least four different subsets within this population, each with its own and different needs. The early adopters: Several national studies indicate that low income families with school children have a higher rate of broadband adoption; approximately half of them can access the Internet at home. The cities where we find the highest adoption rates are those where discounted Internet plans have been offered for a number of years and where there is extensive outreach in the public schools. However, these plans are not available everywhere. There are also cost issues: some families have to purchase expensive smartphone data plans to connect their computers, and many families have outdated PCs or don’t have the necessary tech support or lack sufficient bandwidth. These early adopter families also have another issue: understanding the dangers of the Internet in terms of accessing inappropriate content and meeting child predators. The uninformed: We do not want to forget that there are still low income families that know they need to be online and can afford a discounted Internet plan but simply don’t know what plans are available. ISPs like Comcast, Cox and Google Fiber have staff members dedicated to this type of outreach in cities where they offer discounted Internet services. But they will need more local help to increase awareness. The financially challenged: The truth is, there are families that recognize the need to be connected but truly cannot afford to do so. With the FCC’s modernization of the Lifeline program, a $9.25 per month subsidy for broadband services should be available to eligible low income families, if only more ISPs adopted it. There are other programs from local housing authorities and private philanthropy that can also help to defray these costs. The unconvinced and intimidated: Lastly, there are low income families that are able to afford a discounted Internet connection but are simply not convinced that they need one or are too intimidated by technology. Ultimately, convincing the adult heads of household is the trick. They must value access enough to dedicate seriously limited financial resources toward paying for an Internet subscription. When it comes to broadband adoption efforts, this can be the most challenging group of all, representing a significant portion of households living on the wrong side of the digital divide. This group also includes people who don’t know the difference between accessing the Web via a phone or the larger screens of tablets and PCs. Digital inclusions efforts need both dedicated leadership and “boots on the ground” to be executed successfully. Too many efforts focus on providing computers and connectivity but fail to factor in the social dynamic of broadband adoption. To be effective, crossing this divide will take hours and hours of time spent in training and technical support if we are to bring the Internet to the rest of America’s poorest families. Here is one small step forward: Next week, the National Digital Inclusion Alliance will hold a webinar to introduce digital inclusion practitioners and advocates on the state of digital inclusion at the local community level. You might want to tune in. In Canada, many of the challenged families live in remote locations where broadband is not available. You’d think that these numbers would influence public policy in this country. No, because the politicians have their heads somewhere unprintable, and the telecom industry has them by the short hairs. Try to visualize that! There’s a reason telecom providers aren’t all participating in Lifeline – it’s more paperwork and processes with little financial benefit. If broadband is $29.95 per month, and the customer is a Lifeline customer, a small portion of a customer’s bill is paid by USAC, but it’s not like the carrier gets a penny more for jumping thru all the regulatory hoops. If there was a way a carrier could recover it’s overhead costs for participating in the program, more would be part of it.